This image kills me. Kills me dead. Is it spring yet? When I was growing up, they used to say that Montana had two seasons: winter, and the 4th of July. Well not even that sometimes because I've seen it snow on the 4th. ;o} Traveled this very road all the time from the Bozeone to Conrad and Shelby, off whatever it was before the I-15 was interstate, throgh Pendroy, then home, often just at sunrise, because our dad used to enjoy getting up around 2 and leaving wherever we were and being on the road all night. Those were the days...I still love that drive and try to take it whenever I'm home. Yep, everyone still says that about the seasons, but really ... we have three of the four of them! Good summers, and autumns that are usually really lovely. It's just that winter is too long, and spring ridiculously brief -- and I miss springtime. I can even handle the occasional August snowstorm ... because a couple of days later, everything is glorious again. 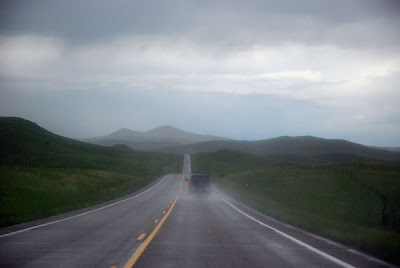 There are any number of wonderful drives in Montana, but one of my very, very favorites is the one from Wolf Creek up through Augusta and Chouteau and on to Browning. The Rocky Mountains on one side, the prairies on the other ... it's just glorious. My grandfather always said, "Montana has nine months of winter and three months of rough sleddin'.!" Especially with an August sun coming up, and on your right endless fields of ripening wheat and barley, and your left the looming front--a place of magic and power for me. Never wanting to take the same road twice, we sometimes made a big circle to the park. US 89 from Pendroy to Browning over Dupuyer Creek and Birch Creek, then Kiowa and Two Medicine, or US 2 to West G. and Lake McDonald--the old stompin' ground!